Many companies are realizing the power of a Virtual Reality training program. However, there are many factors that need to be considered before selecting the vendor right for you. In this article, I share 5 criteria to help you select the ideal vendor for your Virtual Reality training program. If you are looking into a Virtual Reality training program, then you are not alone. There are numerous advantages to upgrading your training to a virtual environment that corporations are quickly realizing. A virtual training approach can produce faster results, has more trackable progress, and offers scalable teaching so you can focus on the higher level aspects of your business. Read more to learn about additional advantages of this learning approach and how to select the vendor right for your Virtual Reality training needs. Why Virtual Reality For Corporate Training? Virtual Reality is ushering a new age of technology and business synergy. It is allowing companies to enjoy efficiencies they never thought possible before. Instead of needing to pay various trainers to get your team prepared for their job, you can let one piece of software do the work. While this passes along cost savings, this Virtual Reality training program can also contribute to your ability to scale your training. It lets anyone on your team access their Virtual Reality training modules from anywhere on earth, from a multitude of devices. In addition to this, you can ensure that the training will be consistent. Now, more than ever, consumers want a consistent experience. When you train someone to do something the exact same way over and over again, you will have business processes that your competitors cannot reproduce. Your ability to grow will be unmatched in your industry as you are at the forefront of this exciting technology. However, you need the right partners on this journey. Choosing the right vendor can be a challenge and needs to be done with much research to ensure you are selecting the partner best suited for your needs. The Virtual Reality training vendor you choose should have industry knowledge that can support your objectives. They should have a background that you can verify. When you do research on this potential vendor, take note of the kinds of projects and clients they have been involved with in the past. If you see something you like, be sure they can explain how it is relevant to what your company is trying to do. If they already know how to work with companies like yours and train people, then there will be less back and forth required before you can start putting people out in the field. This means that you can actually save more time. This doesn't just reduce your operational costs. It also boosts your profits, as you are having to pay for less training hours per employee. The end result is that your Virtual Reality training vendor is now a part of your business that is adding dollars into your pocket that you didn't even realize you could save at first. Company culture is one of the most important aspects of any company. You need people that are on board with your mission. If they are not, they could shift others away from the core of your objectives. However, this does not just apply to your workers. It also applies to your Virtual Reality training provider. If they are going to be providing such a crucial service to your company, they should respect and support the kinds of values that your company stands for. This way, a special kind of synergy happens. They are in line with your company culture, so your employees will be happy to work with this vendor. You can share a great rapport that makes work fun, not just more efficient. And of course, this positivity will show itself in the results of your business. Having a variety of packages and custom options is a must for your Virtual Reality training vendor. After all, each business is unique. There is no one size that will fit all of the needs in your industry, in addition to the various roles within your company itself. You will need different training for management, IT, service, sales, and more. Each branch has their own learning styles, directives, legal compliance, etc. to take into account. If a platform is not flexible enough to accommodate each, you are going to have to sacrifice the quality of your training. As a byproduct, it will negatively affect the final product or service you are offering. Also, one of the primary criteria should be a range of pricing and package options. A Fortune 500 company should not pay the same amount as a small startup or one-person business for a Virtual Reality training program. There should be tiers that reflect different business sizes and needs. Is your Virtual Reality vendor on the cutting edge of the technology of Virtual Reality? Do they constantly attend events and produce content that educates people on what is next? This can show that they have their skin in the game. If they don't, it might just mean they are trying to cash in on this trend. Make sure your provider is constantly looking for ways to improve their offerings. 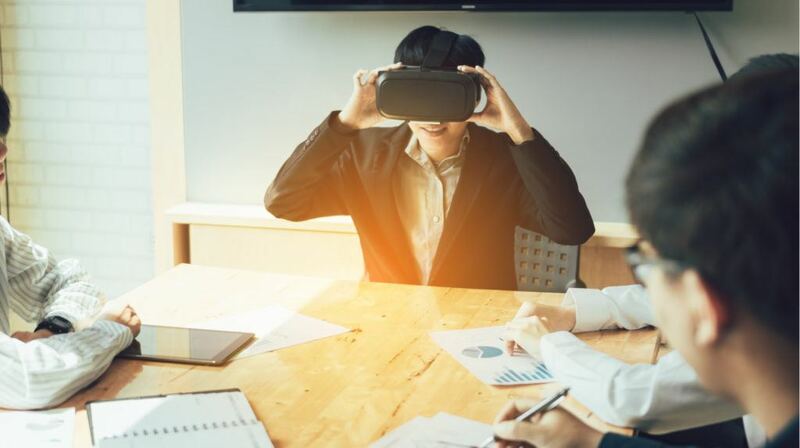 If they have the dedication to innovation that is necessary to keep their Virtual Reality programs at the front of the market, then they can be a great tangible asset to your bottom line. How well does your Virtual Reality training vendor work with other vendors in your space? This will determine whether or not you can expect positive collaborations that promote business objectives and growth. If they are unable or unwilling to work with others, this is a red flag that you should detect early. On the other hand, if they are willing and able to work with other vendors, amazing results can be produced. You can start to see cross-sector innovation in your technology stack in addition to your Virtual Reality training program that enables sales, marketing, technology, HR, and every aspect of your company to promote your company mission. When it comes to getting the most out of your business and your team, you need the right training. If you are considering Virtual Reality, then you are already headed in the right direction. However, that alone is not enough. You need to work with the right vendor to ensure they help you accomplish your goals and objectives. Keep the list of criteria above in mind as you move forward with your vendor selection to help ensure the best decision is made for your company.